Ted Lange’s Langford training stables operates from Rancho de Felicidad. Ted’s communication skills, equine expertise, irrepressible humor, and winning ways in the show ring have made him a popular trainer in many disciplines. Ted, a life-long horseman, has a hugely varied equine experience, from driving horses at Disneyland to training Andalusians, Arabians, Thoroughbreds, Warmbloods, Quarter Horses, and an assortment of ponies, this personable horseman enjoys helping riders improve their relationship with their horse. Ted Lange has trained and/or shown National or Reserve National Champions in the following divisions: Hunters, Equitation over Fences, Carriage Driving, Show Hack, Sport Horse in Hand, Western Pleasure, Trail, and Reining. He is also carded to judge Friesian, Andalusian, and POA shows. 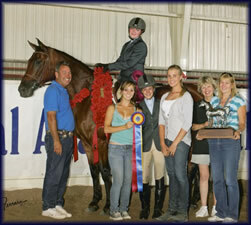 Langeford offers both full training and lesson programs. Lesson horses are available, and Ted can often accommodate riders wishing to explore horse ownership with a leasing program. Lessons are available during the week and scheduled evenings to allow students and working adults ample time to ride and enjoy the ‘stable atmosphere’ at Langeford. Lessons are available during the week and scheduled evenings to allow students and working adults ample time to ride and enjoy the ‘stable atmosphere’ at Langeford.